NFL Super Bowl XLVIII is between Seattle Seahawks and the Denver Broncos at the MetLife Stadium in East Rutherford, New Jersey. Many people at the beginning of the season had pick the Seahawks to be in the super bowl. Most online bookies had the Seahawks as favorite to win the super bowl at the beginning of the season. 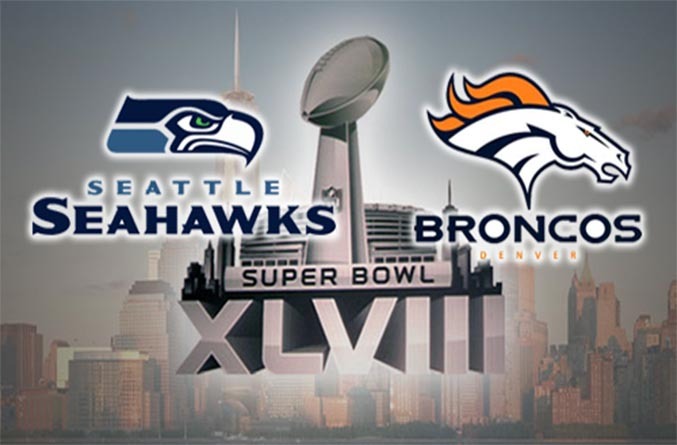 However, online sportsbooks have Denver Broncos as the favorites to win super bowl XLVIII today. Seattle Seahawks offense stats on average per game. 339 totals yards, 202 passing yards, 136 rushing yards, and 26 points per game. Seattle Seahawks defense allowed stats per game on average. 273 total yards allowed, 172 passing yards allowed, 101 rushing yards allowed, 14 points allowed per game. Seattle is a complete defensive team, shutting down any team they play against. However, it takes the offense to put points up to win the game because the defense can’t completely hold Denver to 0 points the whole game. Seahawks offense will need to rally together and put points up against the Broncos defense because Denver offense will score some points. Denver Broncos offense stats on average per game. 457 yards, 340 passing yards, 117 rushing yards, and 37 points per game. Denver Broncos defense stats allowed per game on average. 356 totals allowed, 254 passing yards allowed, 101 rushing yards allowed, and 24 points allowed per game. Denver is a complete offense team, outscoring any team they are put up against but the defense will need to hold Seattle to a minimum because the Seahawks defense will hold the Broncos offense to a minimum.